Lately, when I hear the word “heaven,” my mind wanders to Trout Lake Farm. Since visiting the farm last September with members of our sourcing team, it’s been an image that’s hard to shake. My former career in the wine business exposed me to some outstanding landscapes, but few were as fine and pure as this. Nestled in a pristine valley in Washington’s Cascade Mountains, Trout Lake Farm (TLF) is a little slice of heaven, where 22 different species of herbs and a vibrant community of people live and thrive. Here at Traditional Medicinals (TM), we love the people who gather our herbs as much as our herbs themselves, and we’ve considered the folks at TLF family since the early 1970s. The farm converges where the rainfall of the West meets the sunshine of the East, creating an ecosystem of lushness and light. With rich volcanic soil and passionate organic farmers, there’s really nothing more an herb could ask for. Just ask the peppermint we use for our Peppermint Tea, the echinacea for our Echinacea Plus® teas, and the skullcap for our Stress Ease® Cinnamon tea; they all were born and raised on TLF. After greeting two of TM’s long-time Trout Lake friends, Farm Manager Danielle Hawkins and Sales Manager Allison White, we began our day-long tour. Danielle and Allison walked us around and told us a little bit about the property. Trout Lake Farm consists of two locations: the “West Farm” in the Cascades, and the “East Farm” on the fertile flats of the Columbia River Basin. We source herbs from both. TLF is the largest organic medicinal herb farm in the United States with approximately 1000 acres collectively under cultivation. Being surrounded by long-established organic dairy farms, as well as 1.3 million acres of Gifford Pinchot National Forest, guarantees that the pristine nature of the land will stay safe in perpetuity. The original owners further safeguarded Trout Lake from development under the Columbia Land Trust, helping to preserve the farming heritage of the valley indefinitely. With unspoiled nature in every direction, it’s pretty easy to bliss out. Exploring the West Farm with the ladies, my eyes widened at every turn, marveling how TLF team achieves our high standards, year after year. “We’re in a protected cocoon here,” Danielle explained. “It’s totally unpolluted.” And how rare! The farm sits at the foot of the glaciated Mount Adams (12,276’), offering a direct view of Mount Hood in the distance, and hugging the bustling Wild & Scenic White Salmon River, a depository of clean water and mineral-rich glacial silt that irrigates the farm. Thanks to this silt, the soils here are fertile and loamy. Situated on basalt bedrock and rich in nutrients, the topsoil is almost three feet deep in some places and is high in organic matter. With a high water-holding capacity, strong nutrient uptake, and good drainage, TLF’s soil is able to yield an abundant 670,000 pounds of happy herbs per year. Such fastidious care is taken in every aspect of cultivation that walking around the farm felt more like a stroll through a beautiful garden. In the afternoon, we had the chance to visit lush herb parcels filled with peppermint, alfalfa, catnip, skullcap, and among others…echinacea. TLF is so well known in the herb community for its quality echinacea that herb books and websites reference the farm regularly. And for good reason. As I stood knee-high in a field of their echinacea, guarded by the snowy peaks of Mount Adams and Mount Hood, with a cool breeze blowing down the valley, the notion of paradise transformed from imagination into reality. 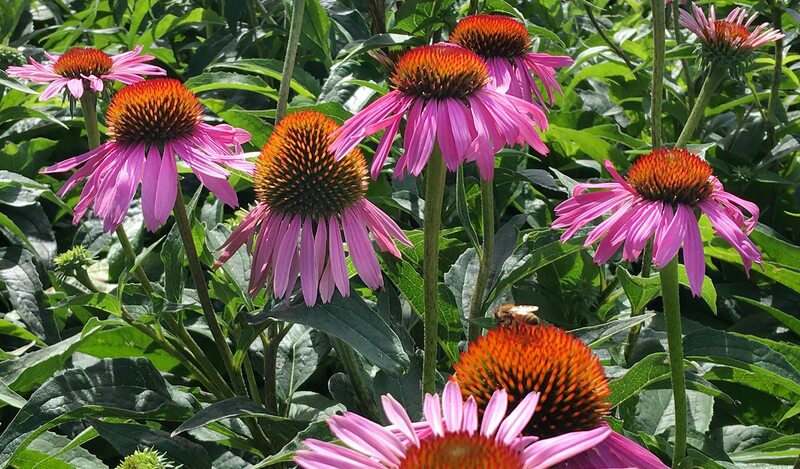 As the great American herb that once grew in abundance, echinacea is much less frequently found in the wild nowadays, but fortunately, TLF is one of its most celebrated enclaves. Danielle and her team have their work cut out for them, not that you’d know it by how seamlessly and meticulously the farm is kept. As a certified organic farm, TLF is prohibited from using synthetic fertilizers, pesticides, fungicides, and GMOs. To keep the soil rich and fertile, they use compost made from the waste of herbs and other unused crops, which only covers 25% of their needs. To complement this, they employ other organic matter like chicken manure, fish fertilizers, kelp, and dolomite. The TLF team then plants short-term cover crops like oat or pea to keep nitrogen levels strong or long-term cover crops like alfalfa and red clover. What’s more, they pull all weeds by hand—unbelievable when one considers the West Farm’s cultivated surface of 282 acres! They plow and rotate crops regularly, giving the soil ample time to rest between harvests and to outsmart pesky insects. Danielle determines harvest time individually for each crop and parcel. After harvest, the team brings the herbs back to one of the cleanest barns we’ve ever seen, where they lay the herbs out by hand and prep them for drying, cleaning, milling, and laboratory testing. Working with the same partner for 40 years has allowed for amazing continuity of quality standards, particularly in pharmacopoeial quality, a standard achieved above and beyond norms thanks to Trout Lake’s dedication to excellence and sustainability. As I stood knee-high in a field of their echinacea, with a cool breeze blowing down the valley, the notion of paradise transformed from imagination into reality. Towards the end of the day, I had a chance to interview Allison, who has been with TLF for 20 years. I was happy to learn that TLF isn’t just paradise for the herbs, but also for people. For over 40 years, TLF has been cultivating community both on and off the farm, much the same way we do here at TM. In addition to doing their utmost to make both full-time and seasonal employees feel cared for, they also extend their hands beyond the farm to the community at large. The management emphasizes that family comes first, which inspires a spirit of trust, loyalty, and long-term security. Full-timers are eligible for benefits, including healthcare, health club memberships, profit-sharing, and annual bonuses. Seasonal workers are paid above minimum wage, are offered health insurance, and receive free on-site housing, access to a vegetable garden, and transportation into town three times per week. Many seasonal workers who come to TLF from outside the United States arrive from Trout Lake’s sister community in Jalisco, Mexico on legally sponsored H2-A visas. Having explored all the nooks and crannies of the farm, Allison and Danielle were keen to give us a taste of local culture in town. Just a five-minute drive up the road, the village of Trout Lake (population: 557) harkens back to simpler times, painting the perfect picture of small-town life. Needless to say, we didn’t feel like strangers for long, thanks to the curious locals who hold court on the porch of The Trout Lake General Store. We then wandered over to the Historic Trout Lake Country Inn, the town’s nighttime social hub, where we ran into TLF veterans and their families, who waxed poetic about old times and enticed us to order the locally made huckleberry pie. That night, the town was abuzz from the aftermath of the annual Trout Lake Community Foundation’s Labor Day Event, which TLF contributes $10,000 to annually in scholarships for graduating high school seniors and continuing education for post-graduates. In addition, TLF contributes organic produce to the local school lunch program. I was happy to learn that TLF isn’t just paradise for the herbs, but also for people. “Trout Lake Farm is all about family,” Allison explained. “It’s a farm where best friends have worked side-by-side for generations. We see a lot of longevity, and that speaks for itself. My mother worked here for 24 years and just retired. I used to be the baby; now, I’m one of the older ones. We may be a small community, but we’re a strong one.” As night fell and the cool air set in, I felt warm—warm with the gift of hospitality, warm with good feelings about the source of our teas, and warm having witnessed the perfect harmony between people and plants. This is what real sustainability is all about. “We may be a small community, but we’re a strong one,” Allison explained. Learn about the industry’s original compostable, Non-GMO Verified tea bags and strings.